FILE - A drought-plagued Iranian farmer carries a shovel to his tomato field in Fars province. Escalating street protests by Iranians against water shortages in a rural part of central Iran have inspired more domestic criticism of the government's handling of the nation's water resources. Overseas-based human rights groups say the protests by farmers in Varzaneh in Isfahan province began last month and escalated into violent confrontations with security forces last week. 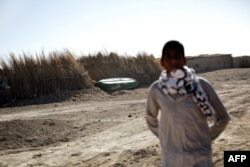 FILE - An Iranian man looks toward an abandoned boat in Sikh Sar village at the Hamoon wetland near the Zabol town in Sistan-Baluchistan province, Feb. 2, 2015. Iranian activists have posted several video clips on social media showing what they said were Varzaneh farmers protesting the transfer of local river water to steel factories in neighboring Yazd province. One of the clips, which the activists said were recorded last Friday, shows a barren area with a large group of people confronting police on foot or on motorcycles. Some of the protesters threw stones at the police, who the video narrator said responded with tear gas and bullets. Iranian state-affiliated news agency Mehr said a member of parliament for Isfahan province blamed the violence on the government. In a report published Sunday, Mehr quoted Hassan Kamran-Dastjerdi as telling an open session of parliament that Iran's energy ministry has "plundered" water from Varzaneh's farmers by redirecting it to steel factories and refineries in neighboring areas. He said the farmers had been working on the land along the Zayandeh River for centuries. In Tuesday's edition of VOA Persian's Straight Talk call-in show, one caller, who said he was in Isfahan province and identified himself as Mohsen, said the Zayandeh River has been drying up, making it harder for farmers to plant rice and driving up rice prices. "Isfahanis are not pleased that water from Isfahan is being diverted to Yazd, even though the people there are fellow citizens," Mohsen said. "The farmers are losing their livelihood because the river water is not available to them. That is why they are demonstrating." Mohsen and the other Iran-based callers to Straight Talk criticized what they saw as the Iranian government's mismanagement of water resources, which have been depleted across the country in recent years. A man who said he was calling from the southwestern province of Khuzestan, said the area had been suffering from water shortages, despite the existence of government-built dams. He also said the government lacked technology to turn wastewater into drinking water and had not done enough to educate people to avoid using drinking water for washing. Iranian officials have acknowledged that outdated agricultural and irrigation systems and poor water management policies in the past three decades have contributed to the shortages. Below-average levels of precipitation in recent months have exacerbated the situation. FILE - This picture taken Aug. 26, 2016, shows an Iranian spending time in Urmia Lake near Urmia, in northwestern Iran. The lack of rain has led to further shrinkage of Iran's Lake Urmia, the largest saltwater lake in the Middle East. 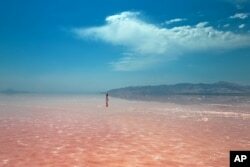 In a report published last month, Iran's Financial Tribune said the latest data from the West Azerbaijan Regional Water Authority showed Lake Urmia had shrunk by 248 square kilometers (96 square miles) over the past year. The report also said precipitation in the lake's catchment area had fallen 7 percent from September to February, compared with the same period the year before. Behrooz Samadbeygi and Afshar Sigarchi of VOA's Persian service contributed to this report.